posted March 18, 2007 04:34 PM bonus applied. Edited by kookastar at 20:06, 17 Mar 2008. Current comments: I decided to work on this a little more after all. Making buildings now (the Buildings section is right above the Racial Ability section in the post). Thanks to Rayquest for the Archon picture. Core Philosophy: Light needs darkness, darkness needs light; balance must be kept. Darkness does not imply evil; just like light does not imply good. Faction Alignment: As per the old saying, �beauty lies in the eye of the beholder�... The Faceless have no defined alignment, as they find themselves above the morale codes of most beings. They appear evil to some, while beneficial to others. After the departure of Asha to one of the moons, the elemental dragon-gods were to rebuild the world damaged by the conflict between order and chaos. The dragons immediately created lesser creatures to help them in that difficult task, and so became the first, legendary races. Elrath, the Dragon of light, with the help of Arkath, the Dragon of fire, Shalassa, the Dragon of water and Sylanna, the Dragon of Earth, summoned the brave, loyal and faithful beings he named Angels (in the primal, dragon language of Asha, �ang� means �servant�, and �el� - �light�), who were supposed to help all the dragons in their quest to reconstruct the world. Malassa, the Dragon of darkness and night, often at disputes with Elrath, disagreed, argumenting that both light and darkness must have an equal share of the world, just as day and night are both equally important in life. She complained how the Angels would be against darkness themselves and how they should be replaced with a more neutral specie. Elrath was against that, convinced that light is more important than darkness or any other element, and that it should have more power by itself. In protest, Malassa seduced Sylath, the dragon of Air, to help her and gave birth to another great race - the Shai-Mala (Shai - bringer, mala - darkness). It was then that Elrath started disliking Sylath, which even resulted in some open conflicts at later times. Cold to each other from the beginning, the Angels and the Shai-Mala started trying to best each others in helping the Dragon-Gods in world creation. They were rising mountains, shaping shores, planting forests, but it was noticeable that a duel between them was inevitable. 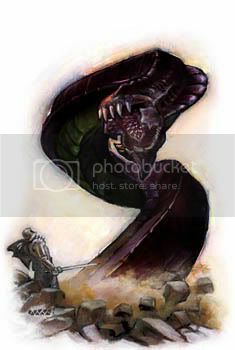 At some point, the situation reached the point where Elrath commanded the Angels to declare a crusade against �the filthy hounds of darkness�, as he called the Shai-Mala. It is said that Malassa�s fury when she heard this was so vast that she scorched an entire island in her rage, afterwards known as the Isle of Wrath. The crusading army of the Angels, armed with the finest weapons possible to forge, have met the forces of the Shai-Mala at a field in the northern parts of Ashan. Engaging each other, it is said that the battle lasted for two entire weeks, before the Shai-Mala were finally closely defeated. The battle scarred the entire northern region of Kreegar, turning it into a huge wasteland. The destruction was so large, it is told, that at the spot where the armies met the earth cracked and rumbled, and blood started flowing from inside it. That place was called Nessus (nessu - blood) and is now viewed as a holy place for many travelers, pilgrims and theologists. As the sign of victory, by legend, Elrath created a peninsula in the shape of one of his claws, marking it for all eternity as a warning for all who would oppose him. The Shai-Mala themselves were punished with exile to a dark abyss-like planar rift named the Twilight Realms, or the Third Plane (the other two being the one which contains Ashan and the one in which the demons are imprisoned). It became forbidden to speak the name �Shai Mala� ever again, and it was ordered that every living creature forgets their looks, and they were hence named the Faceless. Malassa, in grief, made a prophecy that her defeated children will one day return from the Abyss and retake their righteous position in the world of Ashan, and that it will be the day when they are most needed. Seemingly doomed to become mere shadows of the dusty legends, the Faceless, as creatures of wisdom and rationality, honourably went to the Third Plane, to wait. 528. YSD � Tuidhana�s secesion � Tuidhana, a queen of a small realm on the elven-human border, declares her independence, due to greater centralization of power in the elven kingdom. Malassa gives signs to the Faceless, in the Twilight Realms, awakening them from their long slumber. 540. YSD � Due to the harsh situation in her lands, attacked by both humans and elves, Tuidhana is granted a vision by Malassa � that she turns to her worship, and she will grant her protection by her immortal Faceless children. Tuidhana accepts, and makes the first attempt of spell-chanelling a Faceless to this dimension. But, although a powerful mage, she does not fully succeed. The Faceless appears as an image, but still not physically present. Research shows that the first summoning rituals must be held at the gate through which the Faceless were banished in the first place. However, before the Dark Elves are able to finish their research, a massive demon-planted fire burns down the elven capital and the Dark Elves are blamed, and given a choice � exile or death. Most choose exile, but Tuidhana remains and is killed. Before her death, though, she sends a company of 8 greatest and most loyal sorcerers in her realm to travel in secret to Nariya, the Dusk Gate, an ancient monument through which, it is believed, the Faceless were banished. 541. YSD � The sorcerers decide that, as the process of unlocking the gates could be unimaginably long and slow, they need to find a way to make themselves live as much as possible. The only solution, of course, is to embrace undeath. They set off for the Seven Cities (then still not at war with the necromancers) immediately. 543. YSD � Arriving at the Seven Cities, the sorcerers seek out the necromancer guilds that could help them in their quests. 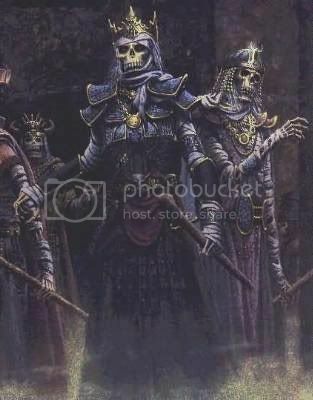 The necromancers first ask them to undergo a vast preparation process, since the essences of lich magic needed altering. It was not common for an elf to seek undeath as a lich. 556. YSD � Finally achieving the status and level of preparation needed for the process, the sacrificial rite is held. However, since the elven bodies and souls are rather different than usual human ones, they need to remain layed in huge crypts until their unresting souls get powerful enough to rejoin with their body and hence arise as liches. 715. YSD � Many years later, when the Necromancers rise to be a more powerful political force in the Seven Cities, the sorcerers arise as immortal liches. Achieving immortality through the greatest sacrifice of them all � their life � they gather their apprentices and followers and set sail for the jungle-covered isle of Hashima, on which Nariya is located. 716. YSD � Seeing their intentions, Elrath persuades Shalassa to release her fury upon the ships of the Lich-Sorcerers. Massive waves start leading the ships to their doom, and one of them even crashes upon the coastal rocks from within the seas, sending Ingchrul, one of the Lich-Sorcerers, to final death. However, Sylath again aids Malassa and grants them good wind, even making Shalassa change her mind. So the other ships reach their destination safely. This further sharpens the relations between Sylath and Elrath. 719. YSD � Finally setting foot on the unpopulated lands of Hashima, the 7 remaining Lich-Sorcerers decide to create the Order of Shadow (in honour of Ingchrul), consisting of them as grandmasters and their followers as apprentices. Together, they reason, they would be able to undo what the Gods have sealed� It would still be an almost impossible task, but this way they�d stand a chance. 723. YSD � Through experimenting on lesser creatures, it is discovered that a certain gemstone, onyx, has influence over the process. Various spell formulas are tried out on onyx to see if it can become of controlled use in the inter-rift summoning. Some alchemists are even secretly hired to help in the research. 731. YSD � After many years of brushing, chemical experimenting and spell imbuing, a perfect mixture is found. Onyx, brushed into orbs and with various auras, is found to be an excellent shadow catalisator. When the Dark Elven clans are brought word of this, most are sceptical and refuse to help the Order of Shadow. A few clans, however, agree to start mining and sending onyx to Hashima, although it was hard and expensive. 756. YSD � Finally gathering a sufficient amount of orbs, a rite is held to open Nariya and connect the two worlds as one. However, the rite goes awry and instead of bringing the creatures from the Twilight Realms to Ashan, the portal sends the Sorcerer-Liches into the Twilight Realms, crushing their semi-mortal bodies in a whirl of eldritch energy. The Order of Shadow is taken over by their apprentices, who continue with their work, but with much more caution. 757. YSD � Sagmaron, the most promising of the mortal apprentices of the Lich-Sorcerers, is chosen as the new grandmaster of the order. 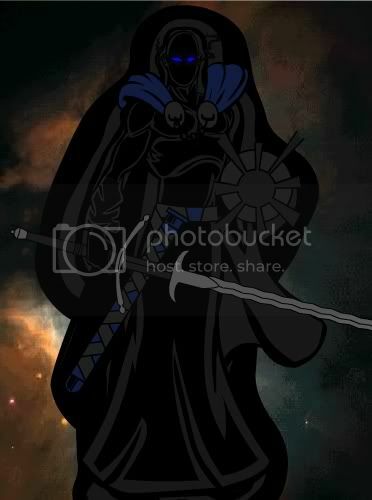 Seeing how in the past years, the order has already gained about 60 chosen members, and how during the rule of the Lich-Sorcerers has brought them much discovery and knowledge about the gates, he prophesizes that the secrets of Nariya shall be unlocked, if not during his lifetime, then soon after that. To help his plans, he does not hesitate to plant spies, thieves and even assassins in various world courts and overall important cities and places. During Sagmaron's rule, the Order�s coffers begin filling miraculously faster than during the rule of the Lich-Sorcerers, although his magic powers are somewhat more limited. 768. YSD � Sagmaron is assassinated by presumably a member of the order. The assassin is never discovered. Ernyroth, little more than a puppet of those who finance the order, comes to power and becomes the new grandmaster. 831. YSD - Due to vast riches that they have gathered over the years, the guild members become less and less active, and more and more corrupt. They start taking gold for themselves, holding orgies and overall degenerating into a society on the brink of falling apart. Seeing that, their main onyx-supplying camps stop sending precious onyx to them. Shadow orb production falls drastically. 842. YSD � Seeing it can no longer go this way, Malassa, with her strength, sends a plague to decimate the members of the order. Out of nearly 100 that the order had at the time, only 20 most loyal and still-believing members are spared (Ernyroth is not among them). They immediately start remaking the order into what it was before the degeneration. 896. YSD � After re-establishing trade networks and successful new research, the order decides to make another attempt at channeling energy into Nariya, in hope to unlock it. Preparations begin. 900. YSD � At the very end of the 9th and the beginning of the 10th century, the rite is finally held. The seas around the island, and the entire island itself, go absolutely quiet. Silence is broken only by the order members� chanting of the old, mostly long-forgotten words of the ancient times. Suddenly, shadows cover the skies around Hashima and everything gets pitch black. Loud, deformed sounds are heard and a huge rip in reality opens at Nariya. The ruins of the surrounding obelisks begin trembling, channeling dark energy and seemingly rebuilding. Then, through the newly opened gate, a tall, shadowy apparition walks out, adorned in pitch-black robes that seem to be connected to its body itself. It looks around slowly and majesticly, then takes a shadow orb from a ritualistic altar. Grabbing the orb, it raises the hand in which it holds it and lets the shady fog pouring from it touch and gather around its body. Then more of them comes out. Each takes an orb and showers in its dark energies. Then, scores of lesser, shady creatures pour out from the portal and swarm around them. The cultists become aware that the Faceless are brought to the world again. Gratefully dismissing the order members, the Faceless start drawing dark energy from the Twilight Dimensions and raising various structures and generators around the island. Gradually, the entire isle sinks into the shadow. Buildings from pure, elemental, solid darkness start looming above the isle and it is soon transformed into a huge bastion of Faceless might, with Nariya as its capital place. The lush jungles are still in existance, but seemingly more dark and perfect lurking spots for the Faceless minions. The Faceless begin with further planning. They aid the Dark Elves and remember their promise to help them return to their lands by any means possible. Preparations are made for that. Various weaponry is created from mixtures of earthly ore and shady materials from the Third Plane, so that they are more lethal than any other known on Ashan. Secluded from other peoples of Ashan, except the Dark Elves and sometimes the Necropolis whom they are grateful for transforming the long gone Lich-Sorcerers, they plot in secret, in the mist of their isles. Finally, in 970 YSD, they see that the Holy Griffin Empire is seriously weakened by the never-ending demon hordes. They decide to act, stop waiting and retake what�s rightfully theirs. Lingering on in the interdimensional systems, the Twilight Dimension is thought to be the first attempt of world creation, even before the world of Ashan was meant to be. The elemental dragons didn�t exist then, only the Primordial Twins. And it is said how they were united back then, and working together. However, by the legends, Urgash became jealous of his twin sister�s talents and creativity, and sabotaged her in all her attempts. She created the beautiful grassy mountains, he turned them into little more than mounds of gravel. She made a sun to shine upon it, but he devoured it. She made beautiful blue skies to adorn the world, but he sent dense fogs to turn it into a pitch black mass of clouds. Finally, Asha created a mortal race of creatures that were to inhabit that world, but Urgash cursed them and turned them into dark, shadowy creatures that were to lurk forever in that, now blighted, dimension. That caused a huge argument between Asha and Urgash, and she banned him from ever coming near one of her worlds. Later on, she started creating the new world of Ashan, while Urgash went into his own fiery dimension to create his demon pets to invade his sister�s world. In the meantime, the Twilight Dimension was forgotten and abandoned by all gods. The creatures they created, however, lingered on in the shadows of that dimension, preying upon each other and battling on for their meager existance. When the Faceless were banished to that dimension, they found the ammounts of darkness there more than satisfying to hold them alive, and even useful for feeding and gaining more power. They quickly subjugated all other creatures inhabiting the realm and brought order to the dimension. It was still mostly a desolate wasteland, but it was now organised and used much better. When Malassa awakened the Faceless from their slumber in the Twilight Dimension, they immediately started training the lesser creatures for battle, to be used as needed in the battles that were to come. 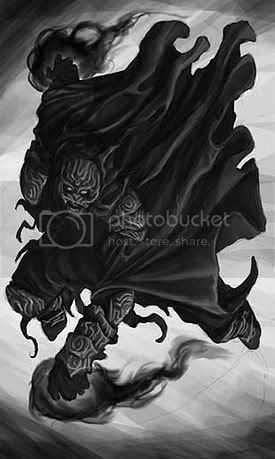 The Faceless have been born from the blackness, as dark, shadowy creatures, but they are tall, straight-up and human-like in some aspects of the looks. They adorn themselves in black robes and clothes, although those are mostly illusions of the misty darkness that surrounds each of them. They are fully aware of the power the illusions might have on the minds of mortals, and use that quite a lot in their battle tactics, buildings and overall appearance. The true shape of a Faceless was never truly discovered, but it is certain that their skin is of pale gray colour and that they have rather long arms with delicate, useful fingers (not claws). Since all Faceless wear robes long to the floor, nothing is known of their lower limbs. During the ages of imprisonment within the Twilight Dimension, the Faceless have became completely dependant on darkness and now, whenever in light, their darkness reserves are emptying, and hence the use of Shadow orbs. The Shadow orbs come as some sort of portable darkness generators, and are created out of shaped onyx imbued with various auras and other enchantments by numerous disciples � mostly ex-members of the Order of Shadow. They are completely in charge of creating those orbs and their loyalty to the Faceless is unquestionable. The Faceless now, whenever in areas of light such as Ashan during the day, seem a little different. The most noticeable thing about their appearance are dense pyres of blackness pouring from their eyes, concealing most of their eyeballs and giving them an eerie, inscrutable look. Other creatures tamed by the Faceless in the Twilight dimension need to stick relatively close to the Faceless as they see them as sources of nourishing darkness. They do not need separate orbs, but need to be in their vicinity to gain the energy to stay in the dimension of Asha. If the sources of blackness were to be taken from them, they would be left all alone and would gradually dematerialize and get dragged back to the voids of Twilight. The Faceless have no political system. They have no need for kings, queens or similar. They acknowledge Malassa as their deity, however, and would do anything for her. That is more because they see her as their mother, not their master. They are wise and honourable beings, but do not let themselves be blinded by chivalry (unlike human knights of the Griffin Empire). That means that they will refrain from dishonourable deeds unless they are left no choice. Contrary to the popular belief, the Faceless do not hate Angels. They see them as equal to them, but driven by sole lust for their goals and senseless bravery. They believe the Angels must exist to keep the balance in the universe, and know that light is essential for many things. However, the Faceless see the demons as pure, vile vermin that must be destroyed if any peace was to be born. Unlike some short-sighted mortals, they are fully aware that allying with demons cannot be an option, since the final goal of Urgash is enslavement and extermination of everything made by Asha and her elemental dragon servants. They will hence rather cooperate even with Angels than with demons. Unbreakable in their resolve, honourable, but wise, very intelligent and above everything free, only a complete fool, mortal or immortal, would neglect the might and influence of the Faceless. The Faceless do not erect buildings as races of Ashan do. Instead, they summon visions of their planar pillars and entire towns from their native dimensions, and then reinforce the visions with earthly resources. That way, they preserve the looks and architecture of their remarkable fortresses in the Third Plane, and mix their otherworldly beauty and shadowy auras with material strength and durability of Ashan. The results are numerous tall towers, dark dungeons, and magnificent domes adorned in primordial runes, glittering mystically with azure enchantments. Darklings are small creatures very limited in strength but found in almost endless hordes. Their hive-like minds allow them to cooperate as one, using their high numbers even better then other creatures do, swarming enemies and putting them down with sheer quantity. Quick and numerous, they can become quite useful in the right hands. Tactical description: A classic SWN (small, weak, numerous) level 1 unit... Moderately quick, so they can be used to deal some damage before falling. Shadowlings are Darklings trained and enhanced by the Faceless. They are still relatively weak and easy to kill, but they have been hardened by training so that they are tougher and more useful. The most noticeable hybridical improvement is that wounded or dead Shadowlings can be fed (or in the latter case stuffed with) the flesh of Ashan creatures which grants them new energy and even brings them back from almost certain death. Flesh is hence much praised among the Shadowlings. Tactical description: Added corpsefeast ability is quite useful, making them last longer, especially combined with the racial ability. They may die quickly, but the enemy at least needs to kill them quite a few times before the little bastards go down for good. Creepers are a subgroup of Darklings known for their agressiveness and predatory nature. Their small size and physically weak nature aren�t such a decisive factor when hundreds of them leap towards their target at the same time, screaming and waving their claws fanatically. However, they do not devour corpses like their Shadowling cousins � they prefer to bite things while they�re still moving. Tactical description: If the player doesn't expect much survivability from them anyway, he should go for these guys. Opposing the defensive shadowlings, creepers are used to deal solid damage in an all-out offensive (in the good old "YARRRGH" fashion), but die in a matter of seconds. Shades are strange creatures which exist on the verge of dimensions, walking through both, yet fully existing in none. They aren�t too strong at close combat, but they are quick and hence make excellent spies. Beside that, their maneuverability and speed can be used for great pursuits, in the hands of a wise commander. Tactical description: A useful thing to have, cause of the line of sight bonus, but far from too great in melee. They have better survivability then darklings, but still die fast if unprotected. It requires a skilled tactician to combine the speed advantage of darklings and shades early game, cause a simple charging tactic will most probably lead to your troops being butchered to a zillion tiny pieces. Twilight Shades have an even more flexible connection with their native Twilight Dimension than ordinary Shades, making them be able to shift their bodies strongly in different realms � allowing them to strike harder and endure longer in battles of Ashan, yet concealing in the Twilight when they need to avoid an attack from afar. Tactical description: Needless to say, better tactical options due to receiving only half damage from ranged attacks. Solid stat boost. Deathshades are known to be able to cross between realms in the matter of a second. They can walk through one dimension and then spray out in another, attack, and disappear again, leaving but a dead enemy as a warning for those who would oppose them. Tactical description: Only a minor attack boost, but also the praised "invisibility" ability, which would work more or less like the one from Heroes 5. Myst Seekers are strange creatues which have developed wings in order to ensure easier survival in the unforgiving wilderness of the Twilight Realms. Rather intelligent, they are far from simple beasts - they are the unique flying unit for the Faceless armies. Their aerodynamic shapes allow them to glide through the air easily, evading a certain portion of enemy melee blows. Tactical description: Continuing the pyramid of survivability, myst seekers die harder than shades (though they're still not too tough), mostly due to their Swift ability. And they can fly, which can be useful at times. Myst Stalkers are aerial predators whose swiftness can only be matched by their fury when they attack their victims. Such is the speed of their strikes that, by the time their enemies manage to raise their weapons in defense, the Stalkers have already performed their attack and are up in the air again, preparing for another one. Tactical description: I still consider No Retaliation one of the most useful abilities in the game. Small stat boost granted additionally. Myst Thirsters' wings are so dark, and their flapping speed so great, that when they come down to their victims in all their fury, they cause much confusion and disorder. Even when they have finished their attack, the enemies remain bewildered with the huge cloud of black wings that has just hacked its way through their ranks. Tactical description: These are best employed against archers, and in larger battles. Maybe it's best to keep Myst Stalkers early game, and later reupgrade them to Thirsters if you find time and cash. Even though the Order of the Shadow has been disbanded, there are still mortals who serve the Faceless cause for various reasons - some seek power, some knowledge, some protection. They help in the production and safekeeping of Shadow Orbs; hence, they are among the rare mortals who are allowed to wield them and, limitedly, use their magic power. Tactical description: Finally a ranged unit. Can cast Eldritch Arrow, which can come in handy if they're surrounded or something, and the Slow spell can cause quite irritating effects on the enemy. Disciples who choose the martial path are given the title of Black Monks. They discard their spellcasting potential in favor of studying the arts of combat and meditation; but are still devoted to safekeeping the Shadow Orbs and can transfer their power to their leader in the heat of battle. Tactical description: If you want cold, hard damage, these guys are there for you. No ranged penalty is awesome, and Orb Channel is handy too, but low stats (no stat boost at all actually) compensate somewhat for that. Black Acolytes are Disciples who prefer the power of magic over physical might. They are instructed to further understand the dark powers of the Shadow Orbs, and can use them more efficiently. They also practice a meditating philosophy which allows them to regain lost magic power in battle. Tactical description: If you prefer magic, these guys are for you. Additionally, they have some stat boosts, unlike the Monks. In the inter-dimensional corridors of time and space lurk magical creatures known as Rift Worms. No one knows how the Faceless have bound them or convinced them to join their cause; but they are certainly a useful ally, crawling through spacial rips and appearing where they are most unexpected. Tactical description: Continuing the saga of quick, tactical units, Rift Worms can be a real pain in the arse for enemy ranged troops. They also have solid attack value, and can be trusted to teleport to a key position when needed. Rift Wyrms are longer and have considerably greater constitution than their Rift Worm cousins. Beside that, when they are encircled, they are known to swipe all of the surrounding enemies with a complex circular turn of their strong tails. Tactical description: Defensive upgrade. Grants a solid hit points and defense boost, minor additional attack, and the tailswipe ability (which can be fun). Similarly to the snakes of Ashan, the teeth of Rift Snakes contain a strange otherworldly poison, whose unpredictable chemical reactions with various enemies can have devastating effects in the right circumstances. Tactical description: Not too much survivability, but very, very useful special. Though a bit unreliable, depending on what effect you need. These large, sturdy walking statues are made by mixing the Golem-creating principles brought from the wizard lands, with the eon-old stonecrafting ability of the Faceless. As their name suggests, Onyx Keepers are created from rough Onyx stones and mostly act as guardians where that is needed - this is the perfect assignment for them, due to their lack of living mind. Tactical description: You may have noticed that there aren't much tanks around in this faction, but that's only until you reach the onyx dudes. Their growth is small, but they're reliable and extremely tough, though a bit slow. Onyx Crushers are reinforced with various sorts of metals mined in the Twilight Realms, which makes their attacks even more devastating. Few armors can stand up to their huge onyx fists, and even those that do are quickly crushed in a few attacks. Tactical description: If you prefer offense over tanking, Crushers are your choice. Their damage is not too high (though better than the keepers'), and they receive very small stat boosts, but their abilities make up for it. Useful, but this choice leaves you with more or less no tank in the army. You may want to have some Onyx Crushers and some Onyx Sentinels (alternative upgrade), but due to their small growth, this will be a tough choice. Onyx Sentinels are eternal guardians of the Faceless chambers, portals and other important places. Besides being clad in even sturdier metals, they are also imbued with shadow enchantments that allow them to be completely resistant to the magic of Ashan. This vastly increases their survivability and makes them incredibly hard to destroy. Tactical description: Ubertank. Plain and simple. The Faceless are immortal beings, rulers of the Twilight Realms and masters of the shadow portals of Ashan. 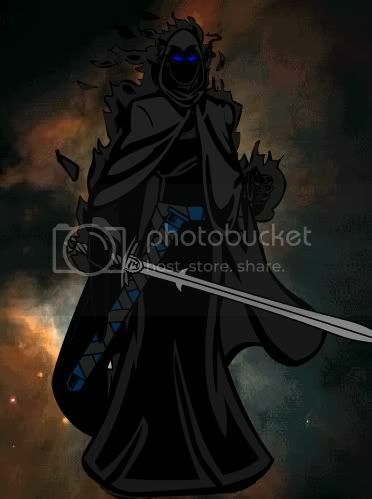 They are known to be able to walk through shadows and maneuvering around the battlefield so quickly that those foolish enough to attack them and their servants rarely get time to repent, with the huge shadow blade struck through their lungs in the matter of second. Tactical description: Similar to their angel counterparts, with enhanced mobility due to Shadow Walk ability. A good all-around unit. The Faceless have no master except Malassa, the Dragon of Darkness; however, they hold some among themselves in higher esteem due to their greater wisdom, combat abilities and leadership skills. These are known as Archfaceless. They forge their own weapons known as Netherblades, imbued with the highest quality metals found in the Third Plane. Eons of blade mastery rendered them able to create such combos with those weapons, that even their enemies feel little but awe and respect before being slain. Tactical description: Netherblade is another one of the useful but unreliable abilities. It's indeed a two-edged blade - it may score a critical strike on the enemy (especially with luck), hit three of them, or strike the one behind the attacked enemy (and that can be your unit, too...). Use with caution. Representatives of the full majesty and grace of the Faceless, the Avatars are a sort of nobility among them; charismatic, intelligent and hardly rivaled in combat. But, though usually graceful and calm, their anger and fury, if provoked, are unsurpassed. When they raise their weapons toward someone and hiss several words in the most ancient of languages, the victim knows it has been sealed with the Mark of Twilight, and that all the dark fury of the Avatars shall soon be upon them. Tactical description: For those that prefer a more reliable strategic approach, the Mark of Twilight is there. Once placed, all that remains is avoid everything with which the enemy may try to stop you, get to the marked unit, and rain sheer death upon it. Twice. Obviously, the Faceless army, though fun to play, would need careful planning and a player which can use and combine their abilities and maneuvering skills to the maximum. The racial ability grants additional strategic options. Choosing the right upgrades for the situation is one of the main keys to success - tank or damage dealer? No retaliation or a chance to cast confusion? Rush or survive? To take a chance or not? Thinking about it all can maybe get too complicated, but strategy's what HoMM is all about, isn't it? I put building requirements in the brackets. I don't know if there will be a town level system in H6. If there is, then appropriate town levels are also needed for each building. As always, serves as the main source of gold. But I was thinking� Maybe it would be a nice idea to include some kind of taxation system in H6. E.g. higher taxes bring more gold but less troops. Additional gold gained would depend on the number of dwellings built in the town � more dwellings, more cash, but fewer troops to recruit. That would make players develop their side towns a bit better� Just an idea. A place to recruit heroes and find out the latest gossip. As usual. HoMM changes constantly, but taverns remain. Obviously a place to trade resources. Also allows the use of caravans to send resources to other players and transport creatures. Provides the hero�s army with ammo carts, first aid tents (a bit more expensive), and ballistas (even more expensive). Additionally, it would add some variety if every faction had its own unique war machine which would be buyable only in their blacksmiths. For the Faceless, it would be the Shadow Pedestal, it would be able to cast random level 1 to 2 dark magic spells on enemy creatures. It would have a limited amount of mana of course. An upgrade of the marketplace, where the player can choose whether to gain additional +1 mercury or +1 crystal each day. Only one at a time. Surprisingly, this building allows you to build ships. Contain spells of appropriate levels. City gate and walls become more durable. Allows a hero to retreat from town siege, and also imbues the growth of Shades in the city. Grants heroes +50% mana once per week, and raises the morale of the defending hero by +2. Grail structure. Beside the classic stuff (increases weekly creature growth by 50%, provides your empire with an additional 5000 gold), it also raises a random stat of your heroes by 50% every week (for example, one week it boosts attack, the other week spellpower, etcetera). The stat raise is not permanent; if one week it supports defence, and in the second knowledge, the defence bonus disappears in the second week. Protects the town with a basic wall. Adds an offensive keep and a moat for additional siege defense, and imbues unit growth by +50%. Adds two more towers on the walls and imbues unit growth by +100%. A building that upgrades the moat so that only flying units can thread upon it. AKA it becomes impassable to land units, except at the gate part (if the gate with the drawbridge is destroyed or opened). An enchanted obelisk-like monument that imbues the growth of Rift Worms, Wyrms and Snakes by +1. Allows the player to recruit Darklings, Shadowlings and Creepers respectively. Allows the player to recruit Shades, Twilight Shades and Deathshades respectively. Allows the player to recruit Myst Seekers, Stalkers and Thirsters respectively. Allows the player to recruit Black Disciples, Monks and Acolytes respectively. Allows the player to recruit Rift Worms, Wyrms and Snakes respectively. Allows the player to recruit Onyx Keepers, Crushers and Sentinels respectively. Allows the player to recruit the Faceless, Archfaceless and Faceless Archons respectively. By channeling darkness to or from friendly Portal troops, the Archon can send his creatures back to the Third Plane (damage them and regain mana), or summon the fallen back on the battlefield (heal/resurrect them and lose mana). In short, it�s trading mana for creatures� health, and creatures� health for mana (can�t tell the exact ratio, since creature statistic standards for the contest are mostly unknown). It�s a combat ability of the hero, and using it ends the hero�s turn. When the hero casts the ability, he selects a unit and then chooses how much HP he wants to give/take from that unit, and the interface shows how much mana he will get. -Basic Warping: Healed creatures don�t remain after combat (when the battle ends, the creature is harmed by the amount of hit points the hero healed it in combat). -Advanced Warping: 30% of healed creatures remain after combat. -Expert Warping: 60% of healed creatures remain after combat. -Ultimate Warping: 90% of healed creatures remain after combat. -Shadow Channel � improves the mana/HP exchange ratio for the Warping ability. -Ritual Concentration � using the Warping ability only wastes 60% of the hero�s initiative. -Blade Mastery � 50% chance for the hero to perform 2 strikes instead of one when attacking. Also, when casting a spell, the hero has a 50% chance to additionally strike a random enemy unit after casting (with a melee attack, not with the spell). -Call of Twilight - further improves the mana/creature ratio, and Warping doesn't waste hero's initiative (AKA the hero's turn doesn't end when he warps his creatures). The Faceless have no names anymore. Since they were defeated in their war against the angels, all memory of them has been ordered erased, and that included their names. However, their heroes bear characteristic titles and nicknames which help distinct them from each other. They still have real names, and they remember them quite well � as their motto implies, they never forget anything � but they are especially hard to pronounce by mortal tongues; and forbidden in Ashan. So, among all but other Faceless, they are known solely for their vocations and aliases, and thus they will be listed here in that fashion. One of the most influential figures among the Faceless, Dusk has taken that name as a memory of the Twilight Realms, which he learned to be so fond of through the ages. Ancient and wise even for immortal standards, he is one of the rare characters that the anarchic Faceless are willing to fully respect and follow. Special: Twilight Marshal � Hero�s troops are immune to spells and abilities that damage their initiative and speed. Additionally, they get +1 morale for every 8 levels of the hero. Pain has well-deserved his name � he is known for his brutality and ruthlesness among his enemies as well as other Faceless. Enemies will never love us, so at least make them fear us � that�s his motto. Those who fall in his hands alive usually tend to regret they were born; and adversaries are never too eager to take on Pain�s army unless they are really, really tired of life. Special: Lord of pain � Decreases enemy morale depending on hero�s level. A dark figure, yet charismatic and with a specific trait that could be called as the immortal sense of humor, Shadowsmile�s name was forged from those two facts. Often described as slightly insane and somewhat hysterical, yet surprisingly calm, he can manipulate others and unnerve them with grim taunts that leave his enemies furious, forgetful about discipline and more vulnerable to calculated attacks. Special: Master of the taunts � At the beginning of battle, reduces the defense of a random enemy creature (amount of defense lowered depends on hero�s level) until the end of the battle; this isn�t a spell and thus cannot be dispelled. Bladewind got his name for his quickness and ability to strike an enemy several times before they even realize what happened. A master with the blade, his skill and battle fury inspires all his troops to fight faster and win a lightning-fast victory over whoever they fight. Special: Swift striker � Grants an initiative bonus to all friendly creatures in combat. Preach finds that mortals have great potential, and could help the Faceless cause greatly if taught well in their ways. Thus he concentrates on preaching the Faceless ideals and philosophy to willing mortals, and training them better. As a result, they like him and fight better and more skilfully at his side. Special: Disciple teacher � Grants an attack and defense bonus to black disciples, monks and acolytes. Bonus depends on hero�s level. A quiet and wise entity, Nether is known for his exploration of the connections with the Netherworld, or the Third Plane with Ashan. As a result, he was always somehow able to summon more reinforcements from his native realm, or transport his troops there and gain more magical energy than his companions. Thus, while most other Faceless practice their tactics with the units they already have, Nether prefers thinking about how to shift them between realms and benefit the most from that in combat. Special: Summoner - Mana/hit points exchange rates become more favorable with every hero level. Snakebite has always been drawn to the interdimensional spaces and creatures that lurk inside them. Among the most majestic of those are Rift Worms, and none understand them more than Snakebite does. Known also as the beastmaster of the rifts, no one is too eager to face his ranks of personally selected, specifically bred Rift Worms... Especially those afraid of snakes. Special: Snake master - Grants an attack and defense bonus to all Rift Worms, Snakes and Wyrms in the hero's army. Bonus depends on hero�s level. Darkcloud's almost childish obsession with flight is embodied in that he adores Myst Seekers, and truly enjoys spending time with them, communicating with them and examining their physique and ways of thinking. They too seem to love him, and from time to time tend to swarm around him in what seems as a huge, eerie black storm. That is also how he got his Ashan name - by that dark cloud of loyal creatures flying endlessly around him. Special: Mystlord - Grants an attack and defense bonus to Myst Seekers, Stalkers and Thirsters. Bonus depends on hero�s level. Thirst adores all sorts and kinds of magic; but not because of power or knowledge she might gain through it. It's because of mana. She seems to enjoy the flow of mana through her body so much that she found ways to drain it from others and make it a part of herself, truly a useful skill to have in battle. Special: Eldritch thief - At the beginning of each battle, the hero steals some mana from the enemy hero or, if the enemy army is without a hero, a spellcasting unit. Amount depends on hero's level. Embrace is probably, of all Faceless, the most versed in mortal ways and behavior. Her silver tongue has swayed many disciples to join the dark host, and many an enemy has laid low his weapons against her in favor of a peaceful arrangement. Though this sort of dealing is unusual for other Faceless, they acknowledge her usefulness and ability, as it saved them from many casualties in various occasions. Special: Silver tongue - Grants a bonus to hero's diplomacy, bonus depends on hero's level. As the Faceless awaken, they set out to gain their hold in the misty islands of Hashima and beyond. They are soon granted knowledge through the visions from Malassa that the demons have been seriously weakened, but that they shall recover and wreak havoc upon Ashan again, across endless seas of time, until the very end � unless stopped for good. Thus the Faceless divide in thought in two groups: those who seek vengeance upon angels and thirst for regaining their lost power in Asha before doing anything else; and those who support the wiser route � to broker some sort of a temporary alliance with the forces of Light, and organize a united army to pass through the infernal portals� this time in the opposite direction, to invade the demon realms and bring down the Demon Sovereign. An ancient and wise archon, known as Dusk (the main Faceless character in the campaign), first among equals in the group of Shai-Mala that supports the idea of joining forces with the Light, embarks to convince (or bind) other Faceless to the common cause. After some struggle, and a few diplomatic victories, the Shadow Host is once again united. Afterwards, he journeys to the borders of the human Unicorn Empire, but is greeted with panic and stubborn attacks on his forces. Angels refuse to hear them out, fearing that it might be a Faceless trick to attack them from the inside. Seeing that this path goes nowhere, Dusk decides to seek out Isabel, the ex-Queen of the Griffin Empire, for her influence would certainly give the Faceless an edge over the angels� carefulness. He finds out that Isabel is currently residing in an elven city, moderately close to the border with the Unicorn empire, and heads there next. The problem is, to reach the elven border, he has to pass through human lands � which is the point of this mission. Dusk arrives at the border of the elven realm, after several battles with human forces (see second mission). Elves, however, do not seem to like the Faceless any more than humans, having heard of their dark appearance, deals with the Dark Elves and Necromancers and battles with the humans. Dusk is left no choice but to fight his way to the elven city and meet Isabel in person. After managing to defeat the opposing elven forces, Dusk meets Isabel, who is rather cold and hateful towards him. He explains her that he had no other means of reaching her; and that there could have been no waiting. He tells her his plan, how he needs her help, and how the Demon Sovereign must be stopped once and for all. After careful thinking, she finally accepts. The angels have been convinced (Isabel�s presence quite helped in that), and the alliance is forged, at least for the time being. Freyda insists on taking the leadership of the Unicorn part of the expedition, but Isabel refuses and claims that it is too perilous, and that the Empire requires Freyda to continue rebuilding it. Instead, Isabel takes command, and her and Faceless army ride to the dimensional gates which would take them to the infernal plane. However, the gates require one of the most ancient and holiest artifacts ever created to open � the Key of the Seventh Dragon, an extremely powerful magical object which the Seventh Dragon himself used to lock the gates between demonic realms. Reasonably, it is hidden well, and impossible for any mortal to find � however, Malassa and Elrath grant their immortals visions of its resting place; a set of crypts and caverns far under the ocean floor, accessible only through a few whirlpools which lead to the underground seas, whose shores touch those dangerous ruins. Dusk and Isabel venture through, and finally, after countless traps and obstacles, reach the Key. The two armies pass through the portals, and into the demonic realms of Urgash�s offspring. They gain momentum quickly, thrusting through the unprepared demon troops and razing hellish fortresses to the ground, aware that they will not last for long � the demons are almost countless, and only by reaching and defeating the Sovereign quickly can they hope to survive. After sacking several Inferno bastions, Isabel and Dusk find out the location of the Sovereign�s main stronghold, and head there immediately. 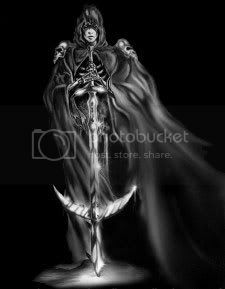 The Sovereign, having found out of the intentions of the Light and Shadow, embarks on his final gambit. By leaving only a single powerful garrison to guard his fortress, he sends all his other troops � massive hosts of demons bred in the pits of eternal flame and pain � through the opened gates, and into Ashan once more, to bring utter ruin to the realms of man and other nations. Many towns are sacked and countless of people slaughtered before the humans are able to organize and put up a defense. This would be the theme of the Inferno campaign. Finding out about this, Isabel grimly decides she cannot go back now, and that the only thing she can do is push onward and take on the Sovereign himself. This somewhat panics the Sovereign, who was certain that they will go back to battle his troops in Ashan. He reinforces his fortress and vengefully orders his troops in the mortal realm to leave nothing breathing in their wake, and not to stop until they destroy the Unicorn capital itself. The next campaign would be about other nations sending their aid to the Unicorn Empire, and prepare defence against the demons. That can be worked out in several ways, and in several campaigns. Some other parallel occurances and events could happen, but I don�t want to stray too far from the subject here. Anyway, the final campaign would be Haven-centered (though pretty mixed with other factions). While Freyda and others are trying to defend their capital from demon hordes marching toward them, Isabel and Dusk, with unbreakable resolve, push toward Sovereign�s fortress, in a desperate race against time and odds. Finally, Dusk and Isabel manage to break through the gates of the Sovereign�s final bastion, and battle him in a final (and supposedly rather cool ) cutscene (Dusk is seemingly killed here by the Sovereign, but since he's immortal he may return in a sequel ). So, they�d defeat him at last, and the demons in Ashan would rush away and scatter in panic and fear, leaving the human capital still standing (what�s left of it, anyway). The Sovereign would be captured and, since he�s immortal and therefore cannot be fully destroyed, locked away by the combined spells of wizards, priests, warlocks, druids, shamans, runemages and necromancers in a magical prison beneath the shifting sands of the wizards� realm, to rot there powerless for all eternity (or at least until Nival decides to develop Heroes VII). The Faceless themselves pull back to their shadowy domain in Hashima, weary from all the recent battles, and slowly expand into the unclaimed territories on the shores, forging their own realm which now has as much might and territory as those of elves, humans, wizards and the others. Since Elrath and Malassa concealed their eternal rivalry for now, the Faceless are allowed to stay in Ashan, and are given their names back. They can once again officially be called Shai-Mala, and remain a permanent part of Ashan. They still choose to retain their fortresses in the Twilight Realms, of course... Just in case. Very cool story Baklava! Looking forward to hearing the rest of it. WOOOOOOOOOOOOOOOOOW man............that's so COOOOOL, I didn't saw such an idea for a long time...baklava for President! Edited by actionjack at 04:09, 19 Mar 2007. When will we see the creature line ups? I did attempt to make a faceless town befoe, but that is borader lining of a more radical idea (as it has several same level creatures). But would be interesting to see what creature would fit into the Faceless. Very nice idea, I like it a lot. An idea for a creature could be a living shadow. Normally it would appear flat on the ground, just like a normal shadow, but when it attacks it seems to form and solidify into a 3D object and it attacks. It could have an ability called Rift of Darkness. When activated it could summon additional shadows(similar to gating, and actually all of the creatures could have this ability). It could also have one where he pulls a certain number of enemies into the shadows depending on the number of units in the stack. Could we please have a caster with teleport?!?! I think that would have a lot of tactical value. Wow. This is a really good history. Do you do much creative writing? You're good at it. I did not take time to read all this until now, but boy am I glad I did read it. I must say that this is by far the most well written town introduction and history I have seen so far, surpassing any in the ICTC, not only because you write in a way that completely captures the attention of the reader, but also because the storyline is so perfectly intertwined in the official material that it is not only believable but actually could be part of it. Brilliant strokes like the meaning of the word Angel (El = Light as in Elrath) and the whole part with the conflicts between the elemental dragons lifts this to another level. I am awaiting the next parts with excitement. And it is a pitty that this did not enter the ICTC, because then it seems there would actually have been some excitement about who would have taken the spot as winner. How about something like this for a creature. This guy is from one of my favorite games, Tales of Symphonia. His name is Shadow and that is basically what he's made of. Do you do much creative writing? You're good at it. Just because I like darkness, evilness, destruction and of cousre chaos doesn't mean I'm wierd. Well...yeah, maybe I am a little wierd, but I don't care. L_o_C: I think he meant the creature was weird, not you. are you going for the traditional Mythlogical and/or D&D creatures, or something more exotic (like self-made up)?